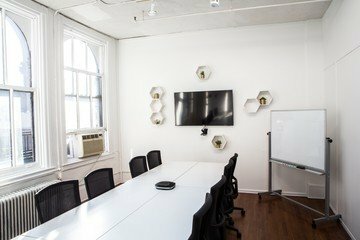 This bright and simple meeting space in NYC near Union Square is the perfect environment for small team meetings for up to 12 people. The corporate meeting space is filled with white decor that reflects the natural light that floods this coworking space. It is therefore perfect for any kind of company who wants to have a meeting with a small team for an affordable price in the city center. 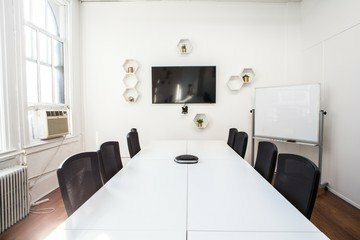 NYC is filled with creative interior design that can sometimes be overwhelming, but the small yet trendy design touches are sure to be a quiet boost to your team’s creativity. This simply designed yet polished meeting space for rent is sure to make your next meeting focused and illuminated. Unlike most real estate in NYC, this meeting space rental is quite affordable. The Union Square space is the perfect size for small team meetings and has affordability that both start-ups and corporations can appreciate. This meeting space in Manhattan would also function for trainings, workshops or team brainstorming sessions. Well-prepared for many kinds of meetings, this space in Manhattan offers a flipchart, whiteboard, video conference capabilities, TV screen, water and hot drinks free of charge alongside your rental. If an additional service is needed, such as a projector and screen or even a catered lunch, these services can be added at an extra charge directly to the booking. 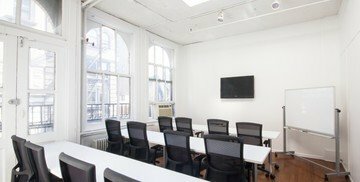 This lovely modern meeting space rental calls Union Square its home. The neighborhood is peppered with many restaurants and shops and enjoys an artsy vibe from the art galleries located throughout. This NYC meeting space is also close to Union Square Park, the perfect place to refresh your meeting-goers with fresh air. It is easily reached by the 4, 5, 6, L, N, Q, R, and W transportation lines. Travelling meeting-goers will find plenty of hotels nearby, such as the Hyatt Union Square and they are sure to enjoy the area as well as the meeting! The radiator in the room was the loudest radiator I've ever heard haha. Constant loud clicking throughout the entire day. The heat wasn't on in the building so we froze both days.